Combine yeast, warm water and tablespoon of sugar in a warmed bowl. Let sit for about 10 mins, when mixture will be foamy. Add the rest of the sugar, salt and 3.5 cups of the flour. Mix well. Add egg and oil and mix until combined. Then start to mix in the remaining 3.5 cups of flour. When the mixture pulls away from the side of the bowl, place onto floured bench. Kneed for 10mins until dough is elastic. Then, place dough in an oiled bowl turning the dough so it is covered with oil. Cover loosely with plastic wrap and place in a warm area (turn on oven for about 30sec - 1min. Turn off and place bowl with dough in it). Leave for 2 hours to rise, but punch dough down every 30 mins). After 2 hours, place dough onto floured surface. Pre-heat oven to 190deg. Cut dough into 2. These will make the 2 challot. With each half, divide into 3 pieces and then roll out into snakes. 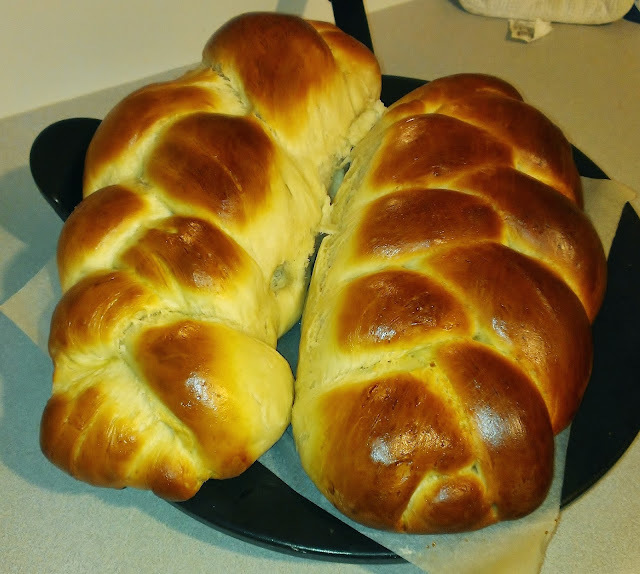 Braid the three lengths into a loaf. Repeat for the 2nd loaf. Cover the loaves for 30mins with a tea towel or plastic wrap and let rise again. Brush egg wash over each loaf and place onto pizza stone of baking tray with baking paper. Then, place in oven for 25mins. Afterwards, turn off oven and leave loaves for another 5-10mins before taking out.